Paella at Ayos restaurant at Burriana beach Nerja. I've recently returned from a fantastic holiday in Nerja and the nearby areas. On the subject of Paella, the restaurant on Burianna beach with the huge pans on an open fire looks very impressive but the so called "Paella" they serve is not good. For a start they are using long grain rice so it tastes and has the texture of chinese fried rice. It is cheap, yes, but not proper Paella. Go to Acebachal (the ghost town) for real Paella. There is only one restaurant thete so you can't miss it. The rice must be absorbant such as Arborio Risotto rice or Paella rice. I’ve recently returned from a fantastic holiday in Nerja and the nearby areas. 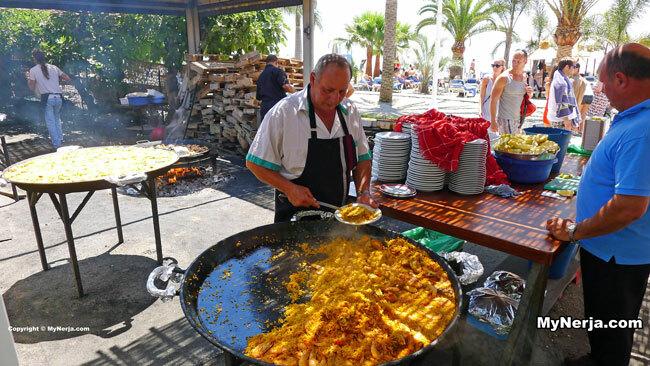 On the subject of Paella, the restaurant on Burianna beach with the huge pans on an open fire looks very impressive but the so called “Paella” they serve is not good. For a start they are using long grain rice so it tastes and has the texture of chinese fried rice. It is cheap, yes, but not proper Paella. Go to Acebachal (the ghost town) for real Paella. There is only one restaurant thete so you can’t miss it. The rice must be absorbant such as Arborio Risotto rice or Paella rice.